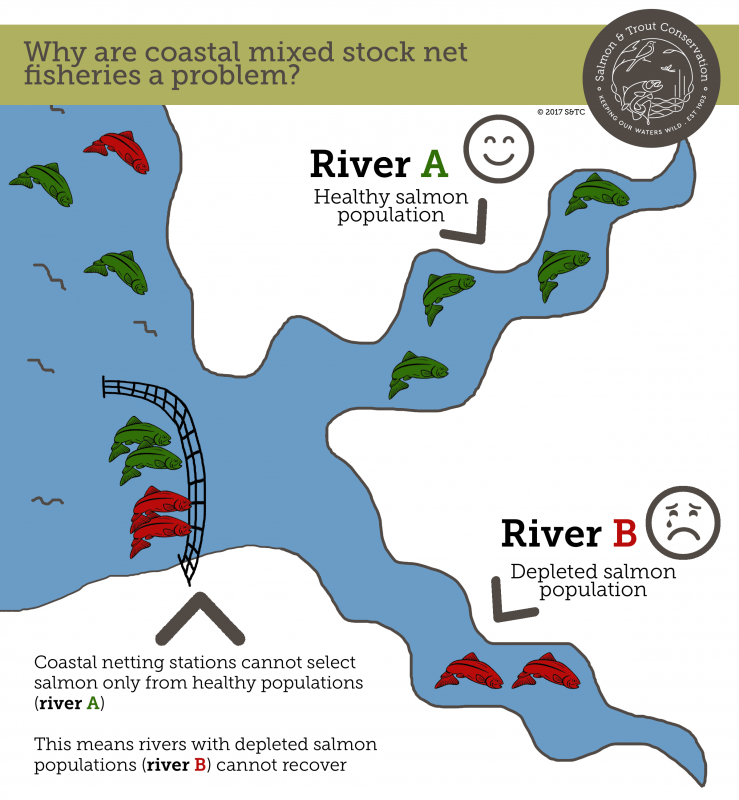 A major part of conserving wild Scottish salmon and sea trout stocks has been the ending of non-selective netting of fish along the coast. If a fish is netted on the coast away from an estuary, it is impossible to tell from which river the fish came from and which it is returning to. This means that managing and protecting individual river stocks becomes extremely difficult and sensitive populations cannot be looked after effectively. Fortunately, through a complaint to Europe, we have achieved the closure of these fisheries in Scotland, thus relieving pressure on wild fish. THERE’S STILL A BIT MORE TO DO…. Despite closure of the Scottish net fisheries, coastal mixed stock netting stations still occur along the North East English coast. While this is not under Scottish jurisdiction, between 30-70% (depending on area fished) of wild salmon caught are from Scottish stocks. We are on the case and continuing to help the cause by working with the Environment Agency on future management of these English nets.